This moon is doomed. Mars, the red planet named for the Roman god of war, has two tiny moons, Phobos and Deimos, whose names are derived from the Greek for Fear and Panic. The origin of the Martian moons is unknown, though, with a leading hypothesis holding that they are captured asteroids. The larger moon, at 25-kilometers across, is Phobos, and is indeed seen to be a cratered, asteroid-like object in this false-colored image mosaic taken by the robotic Viking 1 mission in 1978. A recent analysis of the unusual long grooves seen on Phobos indicates that they may result from boulders rolling away from the giant impact that created the crater on the upper left: Stickney Crater. Phobos orbits so close to Mars – about 5,800 kilometers above the surface compared to 400,000 kilometers for our Moon – that gravitational tidal forces are dragging it down. 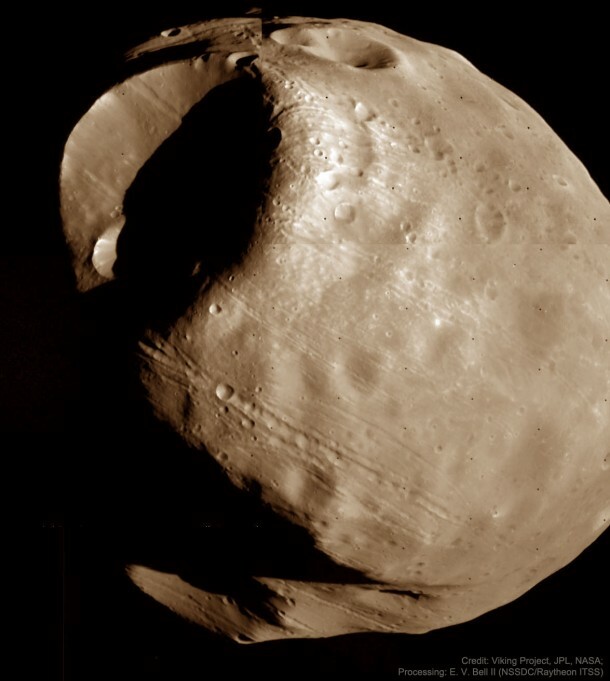 The ultimate result will be for Phobos to break up in orbit and then crash down onto the Martian surface in about 50 million years. Well before that — tomorrow, in fact, if everything goes according to plan — NASA’s robotic InSight lander will touch down on Mars and begin investigating its internal structure.